CBT aims at giving more than just the mere diagnosis. It aims at restructuring people’s thoughts and channeling them to the right direction. It also evaluates behaviors to get rid of the negatives and embrace the positives. If the behavior is determined to be excessive, techniques are deployed to decrease the frequency and/or intensity of that behavior. If it is determined to be an insufficiency, treatment will involve increasing the same elements. Life can be a challenge for most people. It is perfectly normal to have bouts of anxiety, fearfulness, and depression from time to time. Most of us can shake off these negative feelings when they come upon us, but for some, they can linger for days, weeks, months, or years. It is in cases like these where the basic principles of CBT can be the most beneficial. Cognitive Behavioral Therapy in such a simple manner that can be easily understood by any layman like me. I am dealing with a variety of mental/ emotional disorders these days and now I know that cognitive therapy is a solution to my problems. I will start applying the authors advises from today itself. Awesome book that actually covers CBT and all the implications that come with that, instead of going off into other topics, really enjoyed the narration also- highly recommend! Loved this book that actually focused on CBT and all the applications of it, instead of veering off like other books do, but instead actually focusing on CBT and the incredible benefits it can bring- awesome! Take control over your life! Anxiety and depression can really take away so much from the quality of life. This is why those struggling should really act with a sense of urgency and learn more about cognitive behavioral therapy as soon as possible! I really enjoyed this read. It's filled with highly helpful information on how to cope with anxiety, depression and negativity in general. I realized that I have a lot of negative thoughts that I was not aware of, and now I'll apply what I read in the book to start having a more positive life. The book breaks down exactly what CBT is, how it works, and gives the seven main steps needed to do the therapy. It also gives an in-depth look at how to incorporate CBT with various religions or with non-believers, depending on how you feel. One of the parts I found interesting was a section about sin and what it is, how it affects us and how it ties in with CBT. 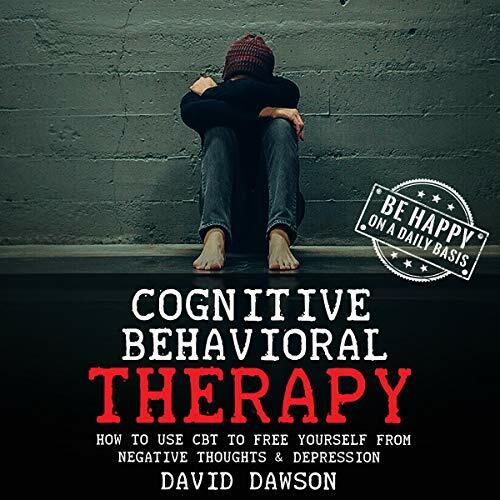 This book stands out for its easily readable explanation of what cognitive behavioral therapy is and the practical advice.I really love the lessons I learned from here Easy to follow instruction work book was useful and easy to follow instruction well written great started options to self help and I strongly recommend it. I never had an audio book that been this good. The voice is ok, the topic was great and it covers almost all I want to know. Great grabbed! Yes, this book can listen in one sitting since you will never get bored from the learning you will able to hear and at the same time, you will be eager to learn and find out more. Thanks for the teaching of this comprehensive audio book, tips for goal-oriented psychotherapy treatment that takes a hands-on, practical approach to problem-solving. This is the ultimate guide to cognitive behavioral therapy! You’ll gain a solid understanding of what CBT is, how it works, and how you can practice CBT to overcome most of today’s biggest problems in society. This is an excellent read overall! I cherished every minute of it and had a really great learning experience. Thanks to the author for this amazing book! Listening to it will quickly give you a complete understanding into what causes anxiety and depression, as well as how you can practice CBT to overcome these very serious mental illnesses. Overall this book was very clear and self explanatory with regards to how to deal with a problem using the CBT approach. The information provided is supported with articles in professional journals and very current. This would be a very helpful book for anyone trying to understand CBT, for a patient in a therapy program, or for someone who is looking for a self help book to deal with a problem. This book is 2 hours long so I listened to it for a couple of days. It talks about anxiety and depression and how to overcome those so it's definitely a great guide in CBT. The book moved me and wake my self confidence when it said that I am the key on what I will be tomorrow and on the future. That I can do all things with proper mindset and having confidence that I can do it because I am the master of myself. Whether you're trying to fight anxiety and depression, intrusive thoughts or addiction, the key to success is learning how to think differently. A good quality audiobook, short and to the point. what's more better than listening from an experienced person who has dealt with depression and all and yet, able to come out strong. it's a profound book that has captured my attention in the first place. i didn't know there's more to CBT than I thought I knew. I want to thank the author for making this audible since I have understood it better than listening. It motivated me to become a better man. Want more of this.